NASA’s Kepler satellite has found an Earth size planet in its star’s Goldilocks Zone. This is the first habitable zone Earth size planet found so far; all the previous ones were much larger than Earth. 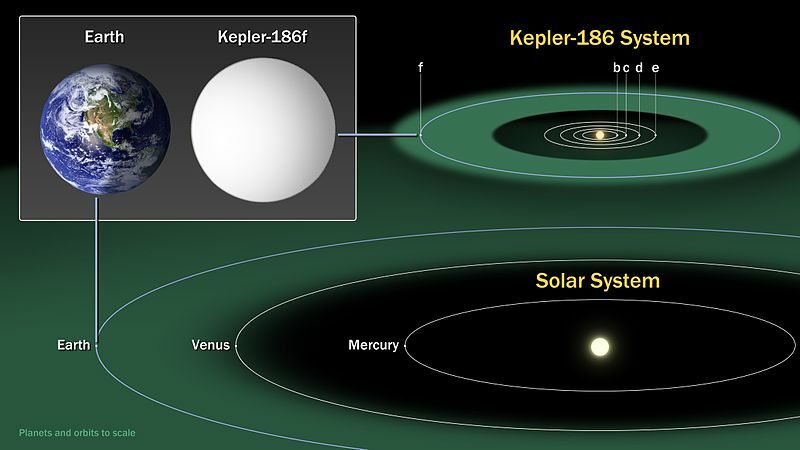 Kepler-186f orbits a star about 500 light years away in the constellation Cygnus. The star (Kepler-186) is an M class red dwarf. The planet is on the outside of the habitable zone, so it’s probably fairly cold, but that really depends on the atmosphere. So far all we really know about the planet is that it’s just a little larger than Earth, and is probably rocky (not a gas giant). Due to its orbit close to the star, it probably has a long day, as long as our week or month. This link on How close are we to finding extraterrestrial life? has some good notes on the types of planets Kepler has found and how new telescopes will help the search. This entry was posted in Science and tagged astronomy, exoplanets, space by Chris Riley. Bookmark the permalink.